Although no one has fared better under the patronage-driven traditions of the America’s Cup, five-time winner Sir Russell Coutts is doing his damnedest to drag sport’s oldest contest into the 21st century by extending the definition to include “commercially viable" and really take the America's Cup mainstream. But in order to create a commercially viable event, first you need to be able to provide a sponsor with basic facts, such as where, when and in what kind of boat the next cup is going to take place. Even with Oracle Team USA successfully defending in San Francisco 2013, America's Cup fans waited 18 months before learning that Bermuda would be hosting in 2017. And the boat has changed twice since then. Although no one has fared better under the patronage-driven traditions of the America’s Cup, five-time winner Sir Russell Coutts is doing his damnedest to drag sport’s oldest contest into the 21st century by extending the definition to include “commercially viable" and really take the America's Cup mainstream. But in order to create a commercially viable event, first you need to be able to provide a sponsor with basic facts, such as where, when and in what kind of boat the next cup is going to take place. Even with Oracle Team USA successfully defending in San Francisco 2013, America's Cup fans waited 18 months before learning that Bermuda would be hosting in 2017. And the boat has changed twice since then. “I actually think it’s a straightforward problem,” says Russell Coutts. “I am not sure we have the right people in the room yet, because there have been a lot of people making arguments about what they believe is advantageous to their team. Last time, for example, we had all sorts of arguments over the length and these opinions about whether this boat would be fast upwind or downwind, and so forth.” In other words, there has been too much petty squabbling and not enough thinking about the bigger picture. “There needs to be — in my view — a much bigger commercial bias, where people are saying, ‘This is good commercially, and therefore good for all of us,’ rather than crystal ball gaze on what could be a competitive advantage. 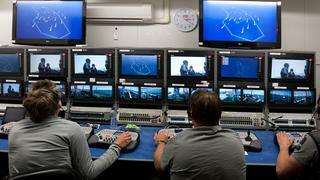 I think that is why the America’s Cup has suffered a lot in the past,” Coutts says. With Moët & Chandon named as the official America’s Cup champagne, Louis Vuitton securing its affiliation with the Cup and Jaguar Land Rover partnering with British team Ben Ainslie Racing, the commercial sponsors seem to be getting on board. In other words, there has been too much petty squabbling and not enough thinking about the bigger picture. “There needs to be — in my view — a much bigger commercial bias, where people are saying, ‘This is good commercially, and therefore good for all of us,’ rather than crystal ball gaze on what could be a competitive advantage. 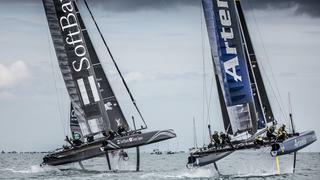 I think that is why the America’s Cup has suffered a lot in the past,” Coutts says. 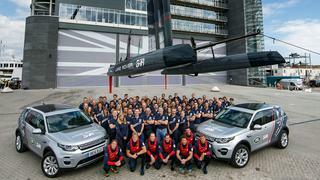 With Moët & Chandon named as the official America’s Cup champagne, Louis Vuitton securing its affiliation with the Cup and Jaguar Land Rover partnering with British team Ben Ainslie Racing, the commercial sponsors seem to be getting on board. Perhaps Coutts is not so disappointed to see the departure of Italian Challenger Luna Rossa, an example of a typical old-school Cup team funded by the wealth of Prada fashion tycoon Patrizio Bertelli, who withdrew from the 2017 event in protest when the America's Cup boat size was reduced to 48 feet. In the Italians’ place comes a fledgling America's Cup team from Japan, SoftBank Team Japan. Although the team’s owner is Japan’s wealthiest individual, Masayoshi Son, founder and CEO of SoftBank, and the Kiwi Cup legend Dean Barker has signed on to skipper the Japanese America’s Cup team, it’s too early to say whether or not Son will be the kind of person that Coutts wants ’round the table. However, with only the Swedes and the Brits looking certain for 2017, the Kiwis’ future uncertain and French hopes of a credible challenge hanging by a thread, the event certainly needs the Japanese. Perhaps Coutts is not so disappointed to see the departure of Italian Challenger Luna Rossa, an example of a typical old-school Cup team funded by the wealth of Prada fashion tycoon Patrizio Bertelli, who withdrew from the 2017 event in protest when the America's Cup boat size was reduced to 48 feet. 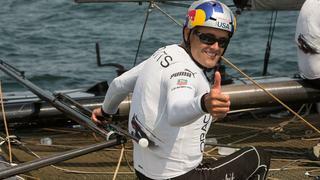 In the Italians’ place comes a fledgling America's Cup team from Japan, SoftBank Team Japan. Although the team’s owner is Japan’s wealthiest individual, Masayoshi Son, founder and CEO of SoftBank, and the Kiwi Cup legend Dean Barker has signed on to skipper the Japanese America’s Cup team, it’s too early to say whether or not Son will be the kind of person that Coutts wants ’round the table. However, with only the Swedes and the Brits looking certain for 2017, the Kiwis’ future uncertain and French hopes of a credible challenge hanging by a thread, the event certainly needs the Japanese. 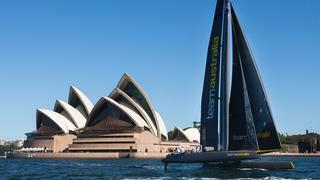 Of course, the Australians should be there as an America's Cup Challenger, too. Hamilton Island Yacht Club became the surprise Challenger of Record in 2013, led by wine tycoon Bob Oatley, but then Team Australia pulled out after becoming increasingly frustrated with tense and protracted negotiations with the defender. This is the third consecutive time that the Challenger of Record has failed to go the distance. Talk about instability and uncertainty. The legacy of Sir Russell Coutts, the sailor, is clear. History will remember him as the greatest of his generation, perhaps the best ever. But his legacy for the sporting event itself? “Improving the quality of the racing, creating more value for the stakeholders in the long term and the present,” he says.